Comprehensive introduction to the practical and theoretical aspects of work at height, including use of a variety of fall protection equipment and an overview of the Work at Height Regs. See Basic Harness Fitting & Use ref: TFP1U for elementary level. Provides awareness of the range of fall protection equipment together with practical experience in the use of the equipment. Our Using Height Safety Equipment course includes the use of a variety of fall protection equipment, equipment care and equipment maintenance. 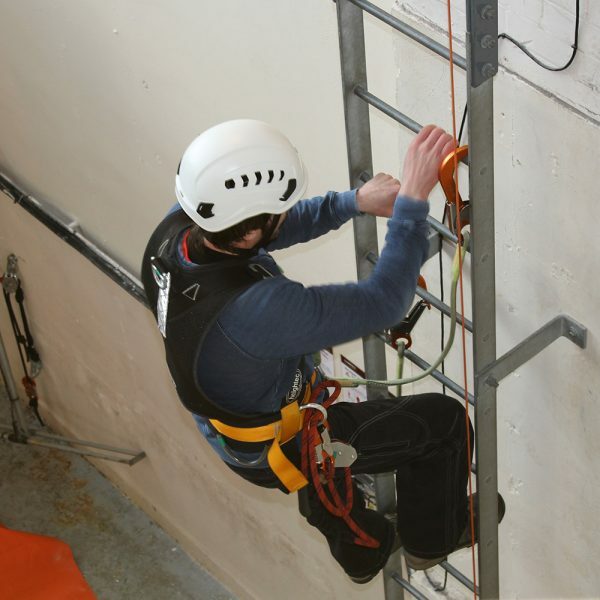 Candidates will be taught the importance of correct fitting of height safety equipment including safety harnesses, together with an explanation of suspension syncope and the importance of rescue. Practical experience of each working method is given, in realistic situations of use. Working methods include restraint, work positioning and fall arrest using both fixed and temporary methods. Also discusses the hierarchy of fall prevention and protection measures set out in the Work at Height Regulations. Explains pre-use check, installation, methods of use and possible defects for specific types of fall protection. The Using Height Safety Equipment course content can be adapted to suit specific needs of particular clients. Optional systems include permanent or deadweight anchors, fixed rail systems, adjustable lanyard with karabiner or scaffold hook, inertia reel and flexible line.